Community Tech Network (CTN) and Sprint teamed up to distribute 15 new Samsung tablet devices to learners at Bluebonnet Studios in south Austin. The residents were provided with six months of free data plans as they get used to their new devices. 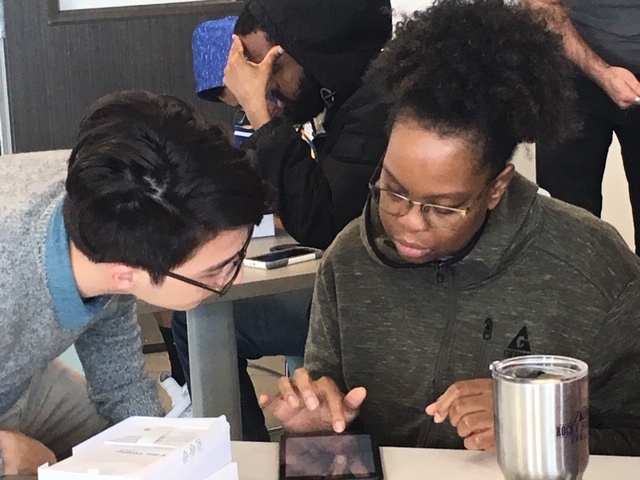 Once they received their tablets, Sprint staff provided individualized training to the learners to help them better connect with family and friends, seek employment, keep up with their schedules and more. The learners got acquainted with device controls, connecting to Wi-Fi, adding their email, and using the Samsung Plus app to learn even more from online tutorials. One resident, Robert, told CTN he was going to use his tablet to help him now that he works as a resident assistant at Bluebonnet Studios. “I know a little bit about using my phone, but I’m really excited to try out all of the tablet’s new features.” A lot of the residents seemed excited that the devices were brand-new — they know it means they’re going to last a long time. Sprint staff trainers Matthew Bryer and Mitchell Percival communicated the importance of providing residents with access. “it was great to get them connected, especially during the holidays, when it’s important for them to be talking to each other.” All residents seemed eager to use their devices to reach out to their friends and family. This is one of many Tech Teach-in events facilitated by CTN. The Tech Teach-Ins match corporate volunteers with community members looking to improve their digital skills and take advantage of what their digital devices can offer. Volunteers often teach learners how to use devices they already have or prepare them to use a new one. Austin nonprofit partners included Austin Pathways, Family Eldercare, AGE of Central Texas, as well as Foundation Communities. Tech Teach-In events are coordinated monthly at CTN. To participate in the program in San Francisco, contact Eric Babb, and for Austin events, contact Jessica Looney.